This is perfect as a side dish, or even on its own, maybe with an egg on top. Leftover keep for a few days in the fridge and can turn into a delicious school lunch!!! Preheat the oven at 425F. Line a baking sheet with parchment paper. Toss the veggies with 2 tbsp of olive oil, some salt and pepper and arrange them in a single layer on the sheet. Roast them for 20-35 minutes until tender and golden brown. While the veggies roast, cook the farro according to packing instructions. Make the salsa verde by combining all the ingredients in a food processor until smooth. 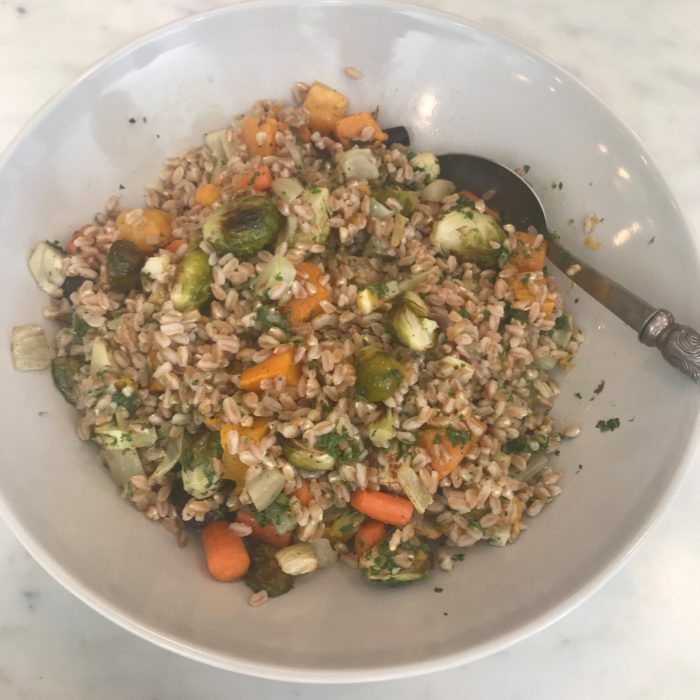 When veggies are ready, fold them together with the farro and a couple of tablespoons of the salsa verde. Taste and adapt the seasoning.